For some of the best reef diving on the southern Spanish coast, join us for a full days’ trip to Tarifa – where a Sea meets an Ocean in crystal clear, fish-filled water. 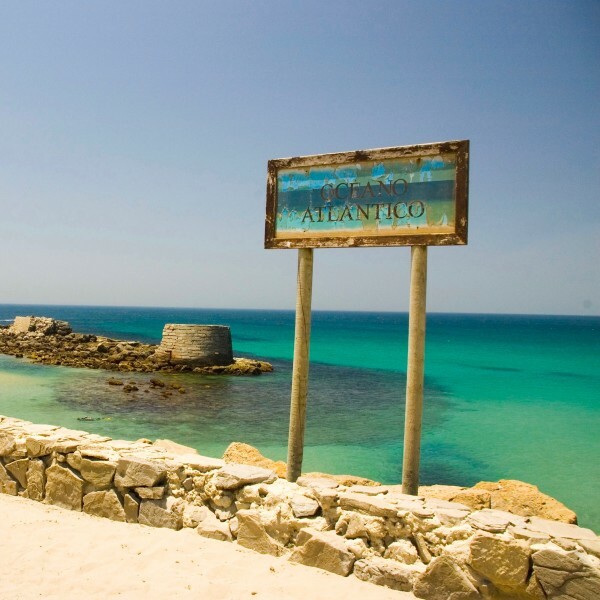 Book a dive trip to Tarifa with Simply Diving Spain and you’ll be guided on two leisurely dives around the island of Isla de las Palomas, part of Los Alcornocales Natural Park and also the southernmost point of the European Continent. Africa is only 13km away and views across the Strait are breathtaking. The ocean currents, often powerful, flow between the Mediterranean Sea and Atlantic Ocean and encourage an overlap of ecosystems as well as an interchange of living organisms, enriching both the fauna and vegetation of the water. The currents differ in both temperature and salt content and therefore increase the variety of habitats and living conditions. These in turn intensify the diversity and number of its cetaceans, other fish and invertebrates. From dolphins to turtles, you’ll need to keep your cameras ready for that not-to-be-missed photograph! Includes two guided dives, full equipment rental, transportation to and from the dive site in air-conditioned minibus, plus light refreshments (bottled water, fruit juice, cookies and après-dive beers). The Stairs (2-8m) For beginners and training. A perfect white-sand sea bed and all year round good visibility, with occasional sightings of the rare Atlantic Pipefish, as well as a host of other Tarifa favourites: cuttlefish, starfish, octopus, nudibranchs. The Cabin (12m) The perfect spot for the PADI Discover Scuba Diving course and for training students of all levels in such courses as PADI Project AWARE Fish Identification, PADI Underwater Navigator, PADI Peak Performance Buoyancy to name just a handful. Also a great reef for a leisurely night dive. The Pool (8m) Fantastic shelf dive with plenty of Common Octopus, Moray Eels, nudibranchs with sometimes the odd Eagle Ray drifting by. The Pool (8m) A shelf with the perfect depth for training sessions. The Wall (18m) A vastly impressive vertical wall, bursting with orange and red colours due to the blanket of soft star coral, anemones and nudibranchs. The ideal reef for the macro photographer and a great opportunity to practice those all important buoyancy skills! The Hole A second vertical wall with lots to explore, including some great swim-throughs. The Wreck of San Andres (30m+) The most popular Tarifa site by far and when you join us for a dive here, you’ll see why! The wreck is the remains of a paddle-steamer that collided with the reef around 150 years ago and settled on the sloping reef. Turtles and Sunfish are regular visitors to the site that is now exploding with life of all varieties. The wreck provides the ideal cleaning station for pelagic species that come in from the Atlantic Ocean for a little R&R. It is also only reachable by taking one of Simply Diving’s boat dive trips, so sign up as soon as you can. Places are limited! The Eastern Edge (4m) For intermediate divers – a shallow platform with parts of the San Andres wreck scattered around a 300m radius. The Eastern Edge As above. Morocco Point (30m) This site is for Advanced Divers only due to occasional strong currents and depth. Some of the biggest and best marine species are often spotted here due to its straddling of the official border between the Mediterranean and Atlantic. Also large groupers and rays can be photographed, while dipping in and out of the jaw-dropping overhangs and tunnels. The Western Edge (26m) For divers of all levels Advanced and above. A regular dive spot for Simply Diving divers on the Dos Mares (Two Seas) Experience! The Anchors (26m) For divers of all levels. The Boilers A wreckage known locally as “Las Calderas”, the remains of this cargo ship are spread over a wide area and encompass the most impressive swim-through in Tarifa. The Admiralty A large anchor with plenty of marine life. The Corridors (4-14m) A site for beginners and experienced divers alike with lots to see. It’s known locally as the Labyrinth for a good reason, so make sure you stick closely to your Simply Diving guide! Playa del Poniente (3-18m) After a dive in the Med, try a second dive in the Atlantic to complete the Two Seas Experience in one day! A white sandy sea bed provides the brightness to light up this long dense reef full of critters. The Costa del Sol has the perfect weather for taking a PADI course or just diving for fun, with over 300 days of sunshine per year. Hence its name! Summer daytime temperatures average 30°C (86°F), with winter around 16°C (61°F). Due to our variety of dive sites, Simply Diving is the only 5 Star PADI centre in the area that can take you diving 365 days a year. What do our divers say? I enjoyed the incredible drift diving along huge, colourful walls and also the sunfish we spotted on the 150-year-old wreck. I was glad to have a good guide so I didn’t miss all the small stuff too. Our dive trip schedule is dictated by weather conditions and diver request and we select the sites on a week-by-week basis. So although we will always do our very best to accommodate any date and dive site preferences, we may ask you to consider alternatives should either of these factors necessitate it.